Cooper's daddy, Tol, is in charge of the Dad's Club at Alex's elementary, which Mark is a member of. The first time Mark and I saw Tol at school on open house night back in August of last year, we knew this was a friendly face, but we just couldn't place him. After racking our brains for a short time, we recalled that he was the incredibly friendly man that helped us rent a Uhaul truck on more than one occasion since moving to Georgetown. After our experience with him, we swore we'd never go anywhere else. As silly as it may sound, he really made an impact on both Mark and I, and we discussed how happy we were to be in this amazing little town full of such happy-go-lucky people serving the public. To us, Tol was the perfect example of what a warm feeling Georgetown gives us. You know how it is when, on that rare occasion, you get outstanding customer service, the kind that feels genuine and real, as if the person actually CARED about people, well this guy was it. And after seeing him up at the school volunteering his time with Dad's Club, PTA, and so many other projects, we knew our assumptions about what a wonderful man he must be, were proven to be correct. Among the many moms walking the halls each day, you are almost certain to see Tol, baby in his arms, and Kindergartener in tow, on their way to class. You see him opening car doors on Friday mornings, helping with fundraisers, and talking with EVERYONE he sees walking down the halls. You'll see him making the rounds picking up teachers recycle bins, helping out in more ways than I probably even know. Everyone knows Tol, not because his baby is sick, but because he's an amazing dad, and human being that shines on all of us. I still remember him telling me how good it feels to walk down the halls and know the kids of the school, and how good it feels when they know you. Those were his words at the beginning of the year, to me, a new parent at Carver, who he knew might feel apprehensive about this new place with all these new faces. Here we are months later, and this precious family has received a major, major blow. 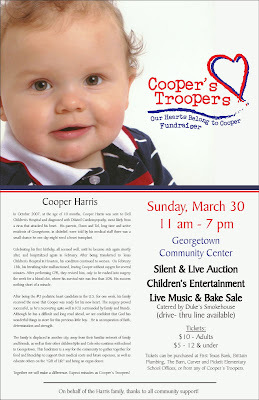 Here is the flyer that's going around Georgetown right now. Please click on the image to read his family's, and Cooper's story. This is going to be a HUGE event, with some 275+ volunteers. Mark and I have signed up to work the event, and we would so, so appreciate it if all of our friends and family could help us spread the word. Come out, grab some BBQ, have some fun, and be a part of something amazing.